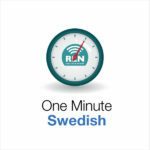 Our One Minute Language series is growing! We added Zulu to our list of languages earlier this year, and starting on Monday 18th October we’re launching One Minute Swedish, Ukrainian, Spanish and Latin American Spanish. Each course will cover the same content, including greetings, introductions, saying that you’re learning the language, counting 1-10 and other common phrases. The courses will run for ten weeks and will be available for free on our website and on iTunes. There will also be premium materials available from the launch date including lesson guides and enhanced podcasts. Stay tuned for details on the schedule for each language. That’s great! I have been waiting for new coffee break french courses to learn, but that’s even more then I expected :)) It’s really cool! You’re doing great job!! !